Touch-screen responsiveness gives tactile feedback and the fastest, most intuitive access to all the phone, web and multimedia features crammed inside – including music, video, gaming, social networking and messaging. Contacts carousel – one-touch access to 20 favorite contacts, each displaying their most recent emails, calls or social media updates and a thumbnail pic chosen by you. Media Bar pops-up to give quick access to instant messaging like Windows Live Messenger, on-board videos or YouTube, access to other sharing sites like Ovi Share, Flickr, Facebook, MySpace, VOX – or just to browse the web. Music features include a world-class quality music player for excellent audio quality, FM radio, stereo speakers with surround sound, dedicated full touch music keys, 4GB built-in storage expandable to 16GB for up to 12,000 songs with album art. Listen to music – plug in the superb Nokia Stereo Headset WH-205 that comes in the box, and features a great tangle-free lead, or plug your choice of headphones into the standard 3.5mm headphone jack, or listen over Bluetooth stereo audio. 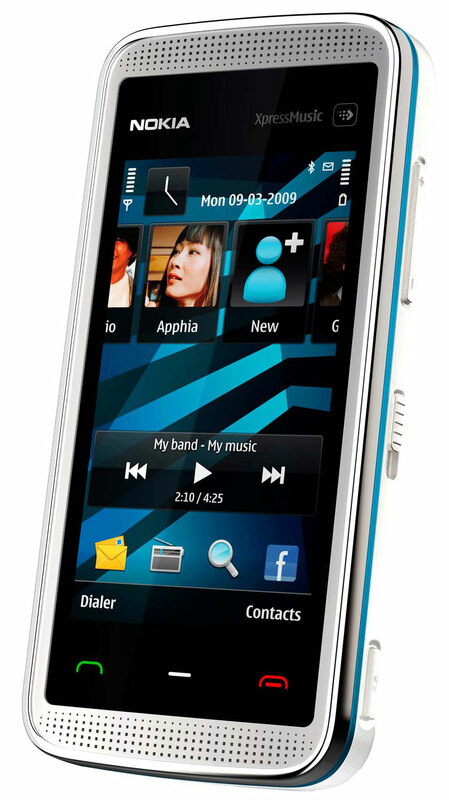 2.9-inch brilliant widescreen with up 16 million colors brings videos, album art, photos and phone menus vividly to life. Accelerometer automatically switches between landscape and portrait format whether you want use the phone, browse the web, watch a video or play games. 3.2 megapixel camera with flash and autofocus for snapping good quality photos and videos. yar is it available in every market!!! hafeez center main mill jaye ga?????? That’s fantastic but I wish if it could be available in the market with insurance(I remember mobile zone were giving insurance for sometime). yar 23000 hai article parh lia karo!! Looks nice, but price is high. Will any one will plz tell which model in best among 5800 and 5530 and also what is the rate of 5800? Will you plz say something about samsung star and LG kp cookie. It was 26000 before, now 2300 it’s been on the market since few weeks now. According to my info. Am I wrong or right? Can anybody tell me which colors of this phone are available here in Pakistan. I want the blue with white and also the Gray with black. Tell me if anybody know..
Price update kardo bhai 20,500 ka hai 5530XM aur 5800XM 24,500 ka hai.